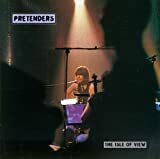 Pretenders', "Back On The Chain Gang"
A Top five song for the Pretenders back in 1983, "Back On The Chain Gang" is such a depressing tune, but with a great dance hall style beat. The words read as though even when you succeed in love (which is definitely not a given in this song), it still feels like way too much work to deal with it. Makes you wonder why anyone would fall in love?